Ten years after her death, Nina Simone is as, if not more, popular today than when she was alive. In 2013, Beyonce name-dropped Simone as her sole predecessor in her documentary, Life Is but A Dream. This same year, a character based on Simone appeared in the Broadway musicals, A Night With Janis Joplin and Soul Doctor, while actress Zoe Saldana set off an Internet firestorm when she was cast in the title role in the upcoming biographical film, Nina. And no one has sampled her more than Kanye West who has invoked her on all but two of his albums, including Yeezus's most controversial track. 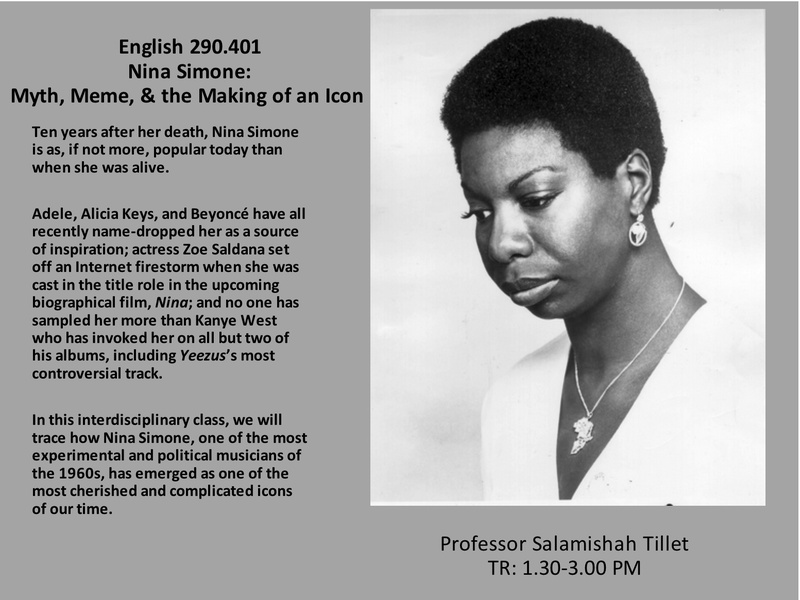 In this interdisciplinary class, we will trace how Nina Simone, through her constant self-fashioning, her redefining musical categories, and the subsequent reinventions of her in contemporary dance, film, literature, and popular music, has emerged as one of the most cherished and complicated icons of our time.